Las Vegas, NV, USA — To address the increasing demand for world-class large-scale audience experiences in major entertainment venues worldwide, Christie® introduces the new Christie Mystique™ suite of tools, including software, hardware and services, previewed at InfoComm 2016 in Las Vegas. Supporting the design, installation, and operation of sports venues and other Location-Based Entertainment (LBE) venues and attractions, Mystique will augment Christie’s award-winning line of projectors, visual displays and services by providing system design, pre-visualization tools, including Virtual Reality technology and 3D printed scale model systems, camera-based alignment tools and system-level monitoring. Simulates and validates system designs to meet quality standards of today’s leading attractions and venues, as part of the planning process during which Christie works closely with integrators and customers. Virtual Reality and through physical scale model representations of the system, providing a real sense of what the system would look like without the time, hassle and expense of physically setting up a mock-up of the venue or attraction. Allows for a more collaborative process, which can include the creation of a scaled projection system for our partners to use as a sales tool. Provides tools and fulfillment services to help bring venues or attractions from design to reality. Provides a host of existing camera-based warp and blend tools that are ideal for aligning everything from simple stacked projection deployments, to multi-projector domes, to complex 3D objects – solving some of the biggest challenges in the deployment of a complex visual system. Can help define the playback channels to ensure that content providers correctly render the highest quality content for their production with minimal warping required. Helps customers maintain “Day 1” quality across all facets of their display systems. Provides purpose-built tools that help meet the specific operational requirements of the different environments such as theme park dark rides, sports stadiums and arenas by monitoring “system-level” metrics that can’t typically be monitored by individual projector monitoring tools. Integrates easy-to-use re-alignment tools that work in conjunction with Mystique Install to allow technicians to easily maintain system alignment. Allows for additional Christie software and hardware tools to be leveraged, to create customized show control systems. 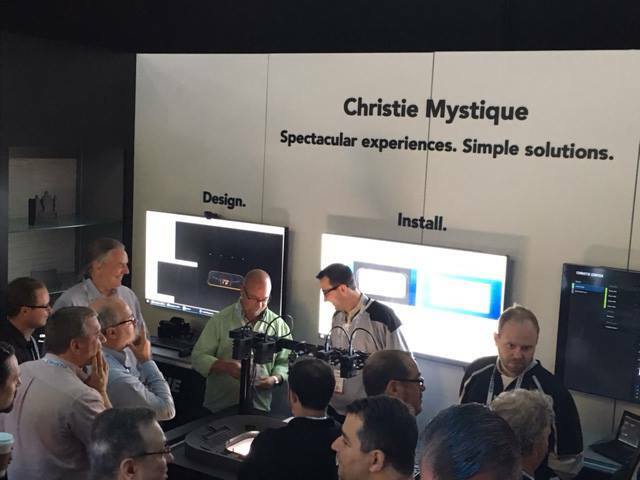 Christie Mystique Design and Install will be rolling out in the fall of 2016, with Mystique Operate planned for the first half of 2017.